and they are thrilled that their 3rd will be a boy. their wish for a brother came true! Oh, your blog is WAY cute! Thanks so much for stopping by mine! I can't wait to do a little digging around here. It looks like great stuff!! That's such a sweet invite (I love the lunch and laughs!). Lovely dandelions! 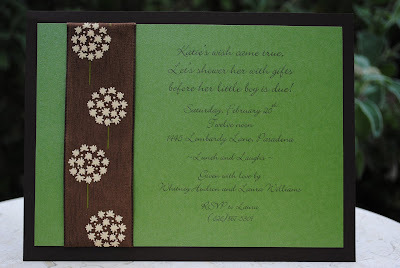 Love the brown and green!